How to Brood Chicks, Ducklings and Poults. 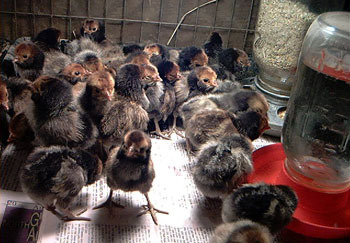 Raising baby poultry. 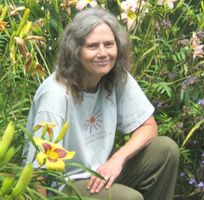 The information here is from the Western North Carolina Farm and Garden Calendar. ...Unless you have a broody hen who will look after them. A few hens will accept babies not their own but they need to have already been going through broody behavior. If she has been spending many days sitting on eggs that did not hatch, you may have a chance with her. Put them near her. You will know right away. I even once had 3 hens fighting over the right to mother some chicks. Finally they decided to share them. So these lucky chicks had 3 mothers to look after them! 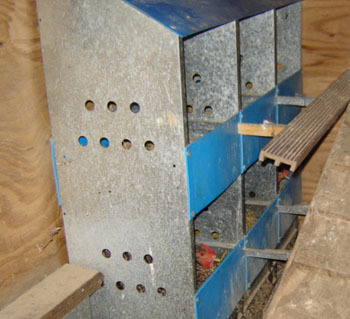 In the nest boxes to the left, you can see hens sitting (setting). 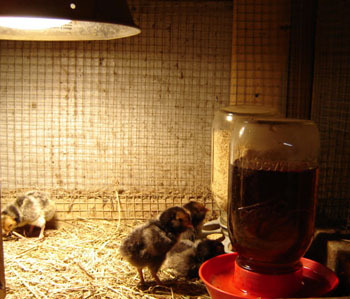 If you don't have a broody hen, then after the eggs hatch put the chicks (or ducklings or turkey poults) in a brooder with a heat lamp (incandescent). This is also what you do with 1-day-old chicks you get from a hatchery. 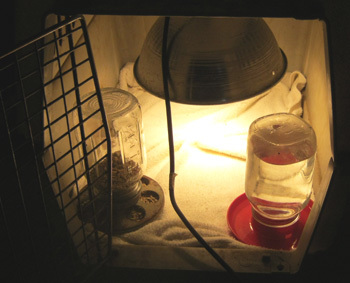 You hang the heat lamp and then raise or lower it depending upon the behavior of the baby birds. Or change the wattage of an incandescent light bulb. Start with 100-125 watts. As they get older reduce to 75 and then 60 watts (incandescent). Many stores no longer sell 100/75/60/40 watt incandescent light bulbs because they are not as energy efficient as flourescent, LEDs and halogen bulbs. However, for brooding the inefficiency means outputting heat. 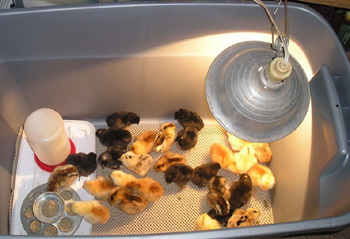 So you can not use flourescent bulbs (CFLs) or LEDs for brooding. 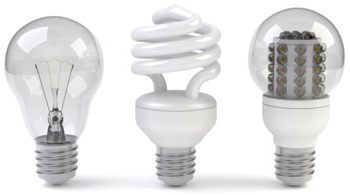 CFLs are 67-80% percent more energy-efficient than incandescent bulbs so produce 67-80% less heat. Halogen bulbs are somewhere in between. Some stores and the internet have incandescent bulbs for sale. If they huddle under the light, then they need more heat. If they are walking around with no huddling under the lamp or crowded in a far corner, then they are happy. They have to have a place to get away from the heat too. They should not be in a breeze. 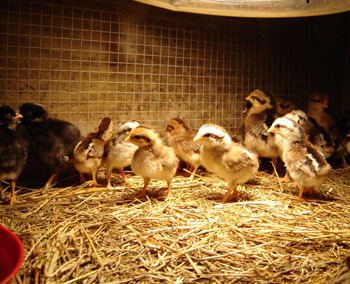 The photos to the left are 2 of several different types of brooders. The first is a large dog carrying case. The second is a large plastic bin/tub. Other photos show a hardware cloth cage. If you have animals such as cats, make sure they can not get to the baby birds. They need to be in a cage that rodents and other animals can not get into. The floor can be covered with small pieces of chaff left over from animals eating hay. You can also use straw, wood shavings/chips, or shredded paper. As time goes on you can put new material on top of the bedding. This is called deep bedding. 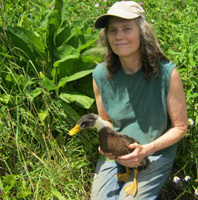 The decomposing manure creates heat for the baby birds. 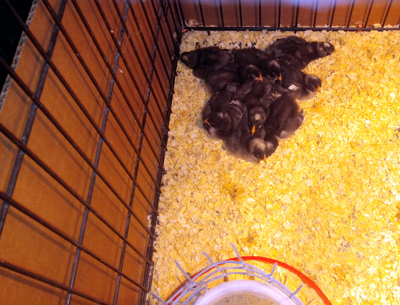 It also provides natural protection from disease because it contains beneficial organisms that the chicks eat. (Chicks forage in the bedding.) It does not smell bad. If it smells, you need to add more bedding material. Buy some chick feeders and waterers. Keep the water fresh. Both chicks and ducklings eat baby chick starter feed. This is high in protein. Ducks and ducklings need extra niacin (vitamin B3) so buy powder or capsules to mix in their food. (Open capsules and pour in food.) Brewers yeast is high in B3 so you can use that instead if you want. Some feed stores carry it, or they can special order it for you. It is good to feed brewers yeast to ducks their entire lives. 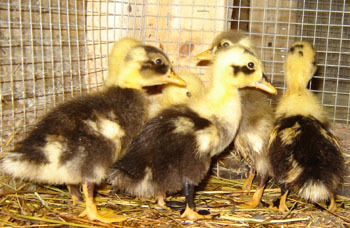 Lameness in ducks is usually due to a niacin deficiency. 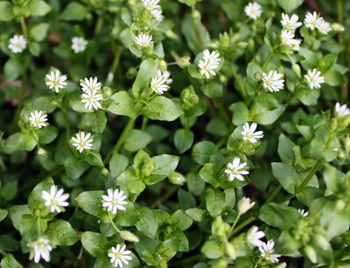 Feed greens with small leaves such as chickweed. After 3 days put some sand (preferably coarse sand) or baby grit in their feed. You can also put a dish of it out for them or sprinkle some on their bedding. If the chicks get chilled, they may get rear-end paste up (gum up). This frequently happens when chicks are shipped. You have to remove the paste up or the chick will die. Just pull it off. Do not wash the chick�s rear or it will get chilled again. 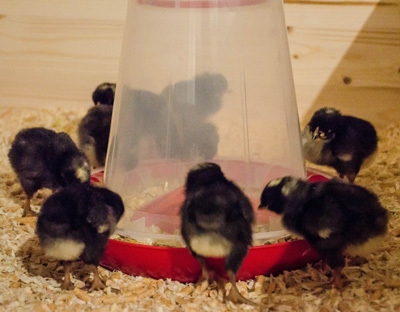 After a few weeks or more depending on the weather, put them outside in a protected area where predators and adult chickens can not get to them. They need more protection from the elements than adult chickens. Keep them enclosed in their shelter for about 2 days so they know where they are supposed to roost at night. After that their door can be open during the day. 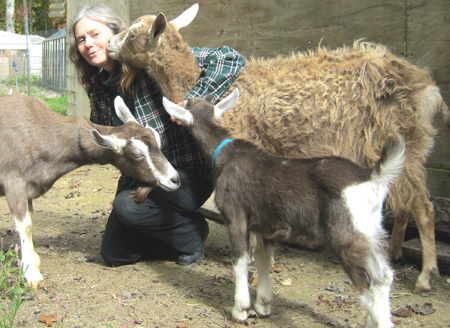 In time they can join the main flock of birds. This photo is from Chris and Chrissey with Dominique chicks. "For my brooder pen, I use a medium dog kennel, about 2'x3', the wire kind. I raise it up off the floor with some 2x4s. I remove the tray that comes with the kennel and slide it under the kennel between the boards." "I line the bottom of the kennel, where the tray was, with 1/8" (#1) or 1/4" (#2) hardware cloth. Then toss in some wood shavings. This allows absorption of the moisture and also, what doesn't get absorbed passes through the floor to the tray. I line the inside of the kennel with cardboard for draft and predator protection." 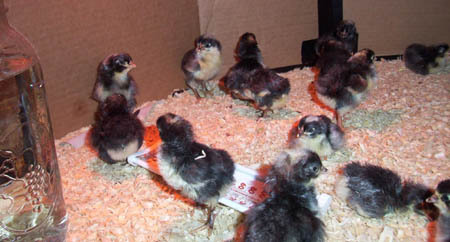 These Dominique chicks are from hatching eggs we sent out. Everyone is happy. Photo by Mike Paulsen, Lyles, TN. Dominique chicks from my eggs. Photo by Mihai in Romania. A Dominique chick with the head up to swallow the water.